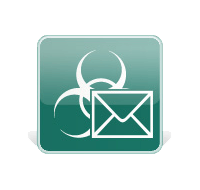 Kaspersky® Anti-Spam provides thorough and accurate protection from spam for users of corporate mail systems and public email services. It is almost inevitable that all email accounts will be targeted by spam at some point. As a result, companies find that a significant amount of work time is lost as employees have to delete tens, if not hundreds, of unwanted messages from their mailboxes. Other side effects include excess costs for Internet traffic, overloaded mail systems and the increased risk of malware and phishing attacks penetrating networks. Kaspersky® Anti-Spam helps mail system users eliminate unwanted mail. It employs intelligent spam detection technology that was developed using the company’s extensive experience in protecting large-scale mail systems.